Hale Hamilton design, manufacture and sell a comprehensive range of actuated stop valves, where a pilot pressure of air or nitrogen is used to open or close the valve. Electric or Hydraulic actuators are also available. Available in a variety of materials, the Hale Hamilton range of valves are used within many applications including; Military Markets, Gas Filling, Mixing and Supply, CNG Filling and Supply Ssytems, Power Generation, Off-Shore, Pharmaceutical, Medical, Compressor, Laboratory and many other Industrial markets. Series ASV156, 7 & 8 are available in Brass & Stainless Steel as either flange mounted for manifolding, or inline ported. The orifice diameter is 13mm, the CV value is 2.5 and the maximum working prerssure is 420. The valve is available adiabatically shock tested by CTE to EN ISO 7291 for use within Medical Oxygen appllications. 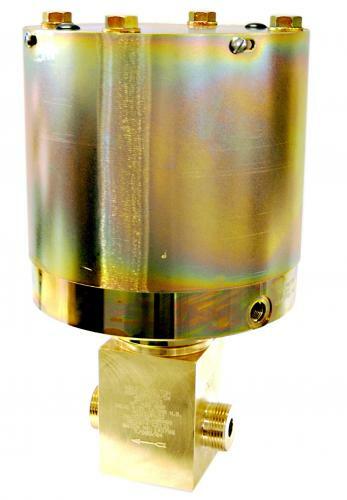 Series ASV130, 131, 132 & 133 are available in Brass, with threaded connections from 1 3/8 12- UNF to 2 5/16 12-UNF with orifice diameters from 12.5 to 25mm and a maximum working prerssure of 420. The valve is available adiabatically shock tested to EN ISO 7291 for use within Medical Oxygen appllications.